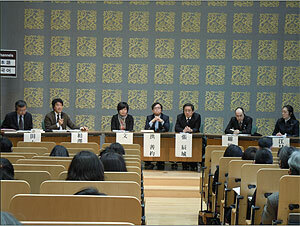 On February 27, we held the above-mentioned symposium at our Institute. The “Art Studies (The Bijutsu Kenkyu)” (first published in 1932) is an academic journal issued by the Department of Research Programming of our Institute, and the academic journal “Art History Forum” (first published in 1995) is issued by the Korean Art Research Institute of Hoshioka Cultural Foundation. This symposium came about because we have been interchanging with Dr. Hong Sun-Pyo, Director of the Korean Art Research Institute, stemming from his assistance as an overseas member for the editorial board of the Bijutsu Kenkyu. On February 27, Dr. Hong Sun-Pyo first made a keynote lecture, and then Dr. Chang Chin-Sung (from Seoul National University) and Dr. Moon Jung Hee (from Center for Art Studies) from South Korea made presentations. From our Institute, Watada Minoru and Emura Tomoko made presentations, and then a discussion was held. We took up the important issue of “evaluation” in art history and exchanged opinions. On March 12, we will hold a symposium in Seoul, South Korea (at Ewha Womans University), with the same presenters. 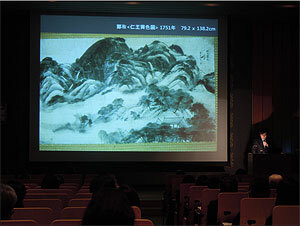 A conference on Analysis of Conditions at Facilities Handling Cultural Properties and Reduced Energy Use by Museums was held on February 25, 2011 in the seminar hall of the National Research Institute for Cultural Properties, Tokyo. The current problem of global warming requires efforts to reduce the emissions of greenhouse gases at every facility. Facilities like museums and art museums are no exception. Facilities like museums and art museums need to have reduced energy use while adequately maintaining conditions so that cultural properties can be safely passed on to later generations. 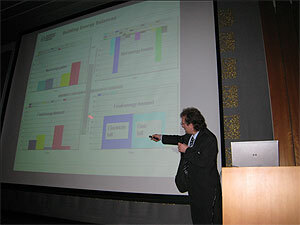 At the conference, Professor John Grunewald of Dresden University of Technology, who oversees environmental analysis of projects to reduce energy use by buildings in Germany, gave a lecture on Techniques for Reduced Energy Use by and Analysis of Conditions in Buildings in Germany. Dr. Rudolf Plagge of Dresden University of Technology also gave a lecture on Methods of Measuring the Physical Properties of Building Materials in relation to Environmental Analysis. Dr. Plagge’s lecture cited the problem of deterioration of marble statuary along Berlin’s Unter den Linden Boulevard. In addition, Motoe Kanno, Akihiro Yagawa, and Akihiko Ohta of the Shimizu Corporation gave a lecture entitled Techniques for Airflow Simulation to Analyze Conditions at Facilities Handling Cultural Properties and Examples of Their Use. They described techniques for environmental analysis and they cited sample analyses performed during renovation of the Nezu Museum’s repository. There were 50 attendees in total, and an active exchange of opinions took place. 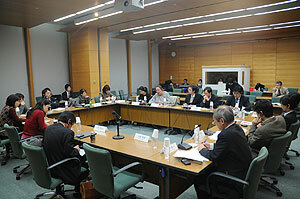 On February 2 and 3, the Japan Center for International Cooperation in Conservation held a “conference on international training to foster conservators of cultural properties in overseas countries” at the meeting room of the National Research Institute for Cultural Properties, Tokyo. As a project to “train personnel engaged in protecting cultural properties in overseas countries” conducted by the Center, we planned this conference to share information and exchange opinions with domestic and international training organizations, aiming to have international training more effectively and practically. The Center focused on training on restoration and conservation techniques and developing the capacity of trainees from overseas countries, centering on developing countries, received reports on the details of training programs, teaching methods and also evaluation methods of training results and some issues, from the persons in charge in four overseas organizations and three domestic organizations including our Institute. Then attendees exchanged their opinions on the basis of these. By analyzing the examples of training conducted, several common issues were highlighted. The major issues included how to manage training projects, how to continue with training programs and how to have mutual cooperation between the programs, and how to share the data acquired from the training. Although we have not previously had many opportunities to hold a conference with such a theme, we will do our best at every occasion in the future and thus help to improve training methods and foster mutual cooperation between many countries. 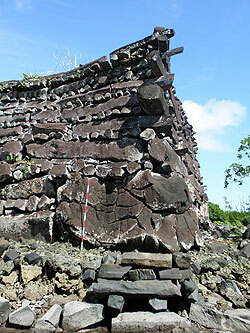 From February 18 to 25, the Japan Consortium for International Cooperation in Cultural Heritage surveyed the Nan Madol Ruins in the partnering country of the Federated States of Micronesia. The ruins are said to have been constructed between the sixth and sixteenth century and are said to have consisted of 92 artificial islands and buildings constructed on them. The full extent of the ruins has yet to be determined, leading them to be called mysterious ruins. The purposes of this survey were to examine the current status of the ruins, determine what needs to be done to protect them, and consider potential fields of cooperation of Japan. The buildings, made by stacking basalt columns, were found to have collapsed in many places. 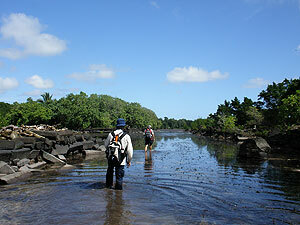 They may have collapsed due to natural weather exposure and the growth of plants such as mangroves. Furthermore, higher water levels due to recent global warming mean that some ruins are now submerged at high tide. A detailed survey regarding these issues must be conducted in the future and a plan to manage the ruins must be formulated. At the same time, local people need to be made more aware of the need to protect these ruins. Some isles and buildings are said to be the tombs of kings and sites of rituals. The need to protect the ruins is pressing, as is the need for comprehensive preservation of oral traditions associated with those ruins. 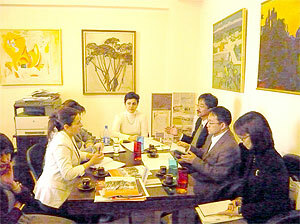 The Japan Consortium for International Cooperation in Cultural Heritage surveyed the partnering country of the Republic of Armenia from February 7–13, 2011. Two experts from the National Research Institute participated in the survey. The survey sought to explore the potential for future cooperation with Japan in safeguarding the cultural heritage of Armenia. 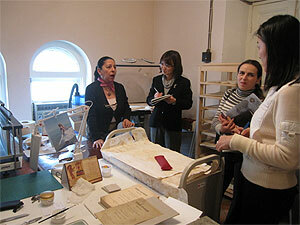 Survey participants visited various institutions involved in protecting and researching cultural heritage such as the Ministry of Culture (Photo 1), which is responsible for the protection of cultural heritage, and the History Museum, the National Gallery, the Matenadaran (the Mesrop Mashtots Institute of Ancient Manuscripts) (Photo 2), and the Scientific Research Center of the Historical and Cultural Heritage. Participants gathered information and talked with supervisors. As a result, the survey identified major problems Armenia faces in the area of cultural heritage. The survey revealed that the country has suffered a lack of capital since gaining independence from the former Soviet Union, and the country also has difficulty training personnel due to the demise of its educational system, which depended heavily on Russia. Although the country has material needs such as the need for equipment and the need to construct museums, it must also quickly train personnel to safeguard cultural heritage. Japanese cooperation in the future should take the form of joint research and training with an eye toward training Armenian experts in conjunction with Armenian research facilities.